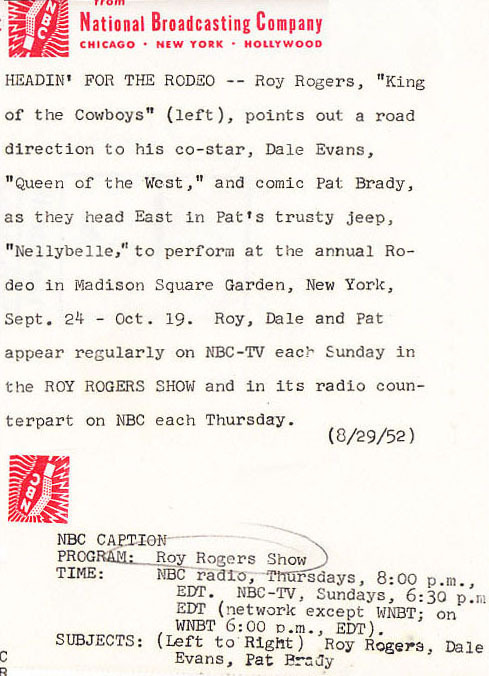 The Roy Rogers Show , broadcast on television between 1951 and 1957, developed out of the series of B-movies made in the 1930's and 40's starring the "King of the Cowboys". It featured a 1946 Willys CJ-2A Jeep named Nellybelle, which had some unusual bodywork. It was in fact owned by Roy, but was driven in the show by his comic sidekick, Pat Brady. The name apparently developed out of Pat riding an ornery mule in the earlier movies, and addressing it with phrases like "Whoa, Nelly!" 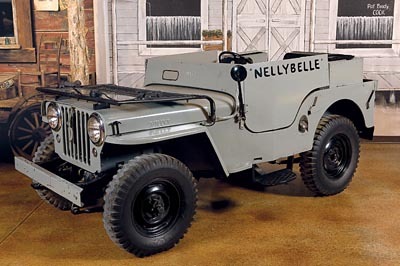 Ralph Perry has noted that in most episodes of the show, Nellybelle's name is painted on her doors, but "in the early episodes the name did not appear on the doors. Would you know what year the name was added?" Well, I have seen at least one 1951 episode where it does appear, and one 1954 episode where it doesn't, so perhaps it's a case of the Jeep being repainted, or even replaced, rather than simply the name being added at some point. 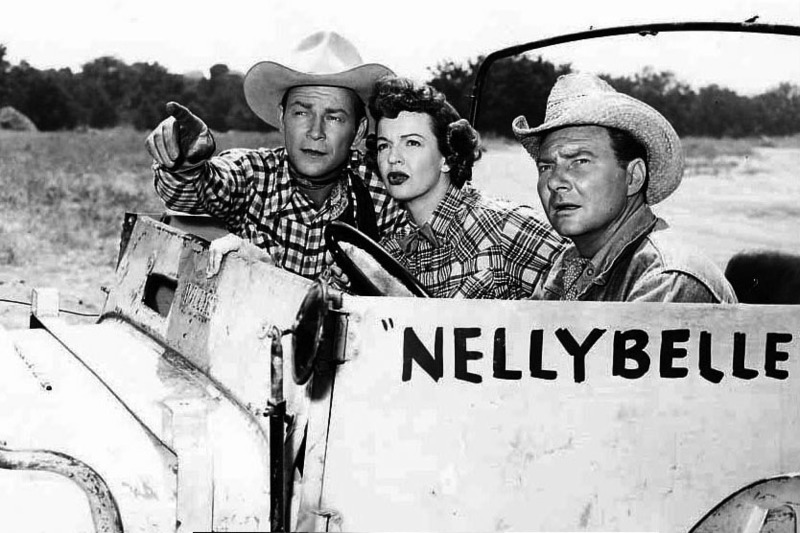 This promotional still of Roy, Dale Evans and Pat Brady is from 1952. See the caption (100K JPEG) added by NBC. 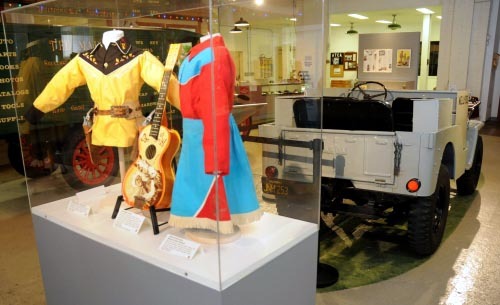 The real Nellybelle was displayed for many years at the Roy Rogers - Dale Evans Museum (right) which moved from California to Missouri in 2003, and closed in late 2009. 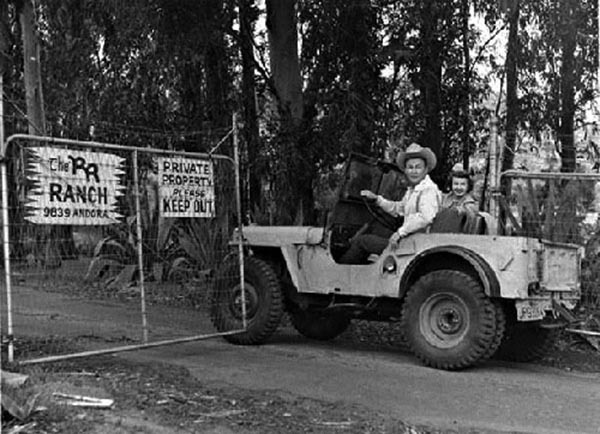 The Jeep was sold at auction by Christie's in New York on 14 July 2010 to a private collection. Colin Peabody wrote to CJ3B.info: "I hope Nellybelle goes to someone who will treat her with love and respect! With the Museum closing, and the sale of all the memorabilia, another American legend will pass from us. How unfortunate." Luckily Nellybelle's new owner Pam Weidel has treated her well, and made her accessible to the public. 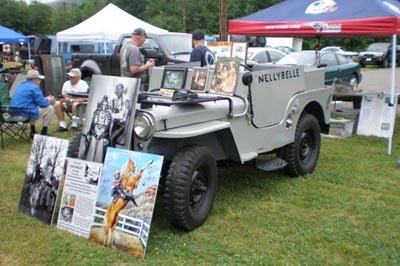 She was photographed in June 2011 on display at the Great Willys Picnic in Pennsylvania, by Bob Westerman. 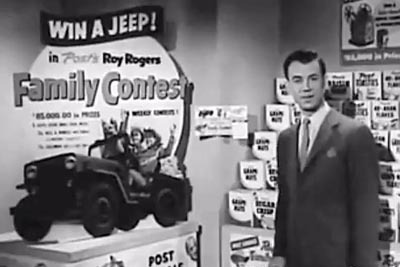 A contest advertised in the June 1, 1954 issue of Look magazine (see Win a Willys Jeep) indicates that Roy and Willys (and Post Cereals) had made some kind of arrangement to promote the new Willys CJ-3B. 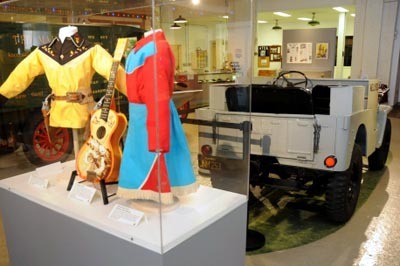 But in response to a question from CJ3B.info in March 2003, Roy Rogers Jr. said he is certain that his father used only the original 1946 Jeep on the television show. Roy Jr. says he is too young to know the details of the origin of his father's Jeep. 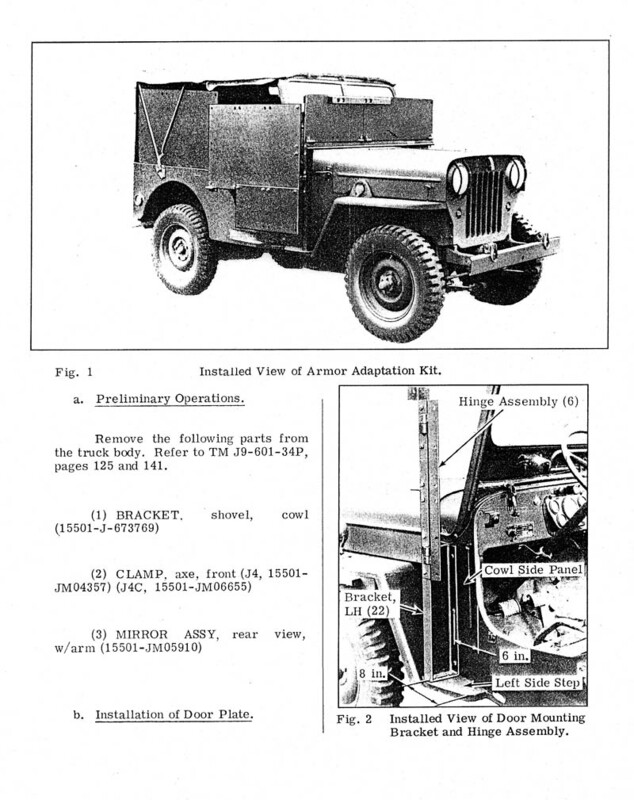 The apparent armor plating around the front bears a strong similarity to the U.S. Army armor installation kit seen here. Steve Davis points out that according to the IMDB, Pat Brady was a tank crewman in World War II, so that may have influenced the decision to armor plate the Jeep. 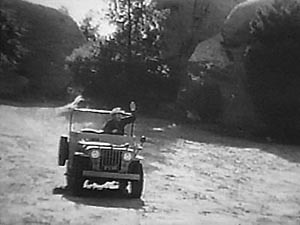 It may have also been intended primarily to hide a stuntman crouching in the Jeep, for scenes where Nellybelle takes off on her own. The "Bad Company" episode seen here is from 1954, and finds Nellybelle as usual in some kind of disrepair -- this time it's her brakes. After waving to Roy, Pat has difficulty stopping to chat. See also a shot from behind (30K JPEG) which shows Nellybelle's rear end details. 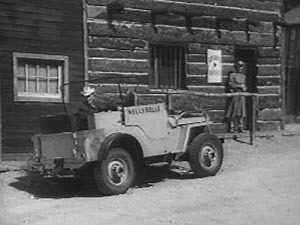 Roy Jr. says the Jeep was painted grey so she would appear a consistent shade in the black & white film used for the show. In this episode, the bad guys who have stolen the box of gold produced by the gold mine, kidnap both Dale Evans ("Queen of the West") and Nellybelle during their getaway. After everybody is rescued, Pat drives two of the villains back down to town in handcuffs. But of course he loses his brakes again, and Nellybelle ends up upended (30K JPEG), in the brush. If you don't see the audio clip, try linking directly to the QuickTime file. 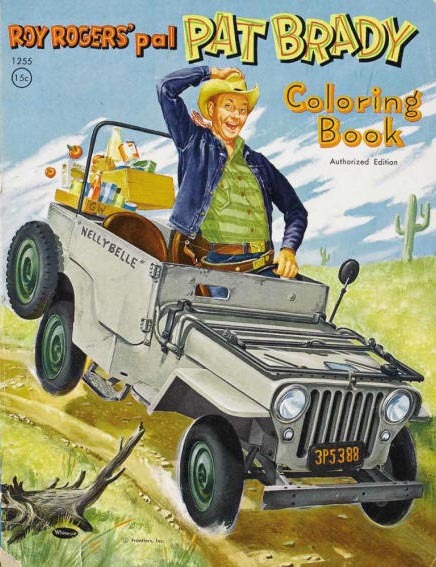 This same episode begins with a wild stunt in which Nellybelle starts rolling down a hill by herself, and Roy chases her on Trigger and leaps from his saddle into the Jeep to bring her to a safe stop. Dale says, "Roy, you shouldn't have taken a chance like that for Nellybelle!" But Roy replies "Well, she's part of the family, Dale." 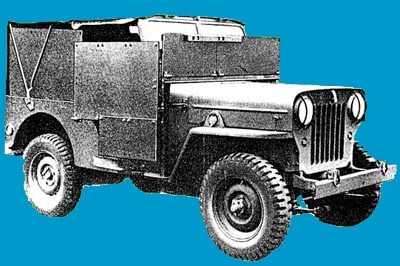 Return to Siblings of the CJ-3B, or to The CJ-3B in the Movies for more Jeeps on the silver screen.